- EXTENSIVE COMPATIBILITY: Works with electric heating underfloor, electric baseboard heaters, electric heating film, etc. 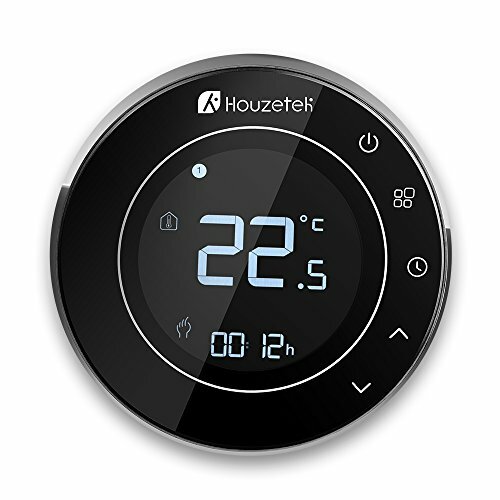 - HIGH SECURITY AND RELIABLE QUALITY: Equipped with dual temperature sensor - integrated sensor to measure the air temperature, free 2.5m external sensor cable to measure floor temperature. Additionally, the external sensor will turn off the heating system to protect you and your devices from dangers when the floor temperature is more than the set points. - VERTICAL ALIGNMENT DISPLAY SCREEN: Unique VA glass display screen gives you ultra-clear viewings from any angle. Features matte brilliant black side edge, strong and durable and anti-scratch. Highly-sensitive touch button allows you to operate easily. Easy installation: simple flush mounting, quicker and more convenient. Support European 60mm round box and 86mm square box mounting.